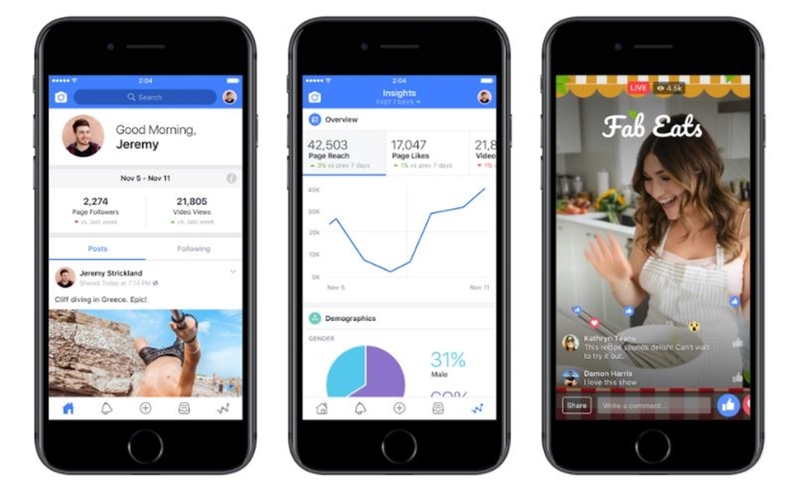 Facebook has taken another massive step today in courting digital creators with the launch of a standalone mobile app to help users manage their presence on the social network — as well as a corresponding website that will furnish inspiration and growth tools. The social network, which counts 2 billion users, first announced the app’s development last summer at VidCon. Launching globally today on iOS — and rolling out to Android in coming months — the Facebook Creator App will enable users of all sizes to helm original videos, fire up Live broadcasts with exclusive features, and provide new ways for creators to connect with their communities of fans, the company shared today in a blog post. The app will be available for both Pages proprietors as well as individual profiles. For instance, a tool called the Live Creative Kit will let users make personalized intros and outros, while a Community Tab will serve as a unified inbox for comments from both Facebook and Instagram, as well as messages from Facebook Messenger. Additionally, the app will enable users to cross-post content to other social platforms, and provide analytics to help them inform future content creation. A select number of creators making shows for Facebook’s recently-launched video hub, Watch, will also be able to log into the Creator app — as their Show Page — to access the above features. Facebook says it will roll out this ability more broadly in the future. Facebook’s VP of product, Fidji Simo, described the ways in which the app addresses the “diverse needs and goals” of different kinds of Facebook creators, including Markian Benhamou (who shares messages of positivity with his #SmileSquad in a Facebook Group), Jody Steel (who headlines the Watch series Body Art), and Jay Mendoza (whose comedic skits are watched by millions). “Creators are integral to Facebook and build some of the strongest communities,” Simo says. In addition to the app, Facebook is also launching today a dedicated website called Facebook For Creators that will house inspiration, resources, and tips for members about how to create compelling content, connect with fans, and grow an audience. Creators who join the website will also be considered for early access to new features and tools in the works at Facebook. “We’ve gathered feedback from creators as we’ve built these resources, and will continue to take cues from the community,” Somo concluded.